How to Weed Out Fake Stamp Menace in India? Fake stamps have now found their way in the Indian economy and God knows how many of these fake stamps may be in circulation. However Postoffices in order to get these stamps out of circulation should make sure that maximum stamping should be in form of computerised billing as being done for speed post and registered letters. Alternatively a person buying stamps should get a computer bill. As responsible citizens we should buy stamps only from valid ticket counters and not from the touts who are likely to be the weakest link for spreading fake stamps in the system. 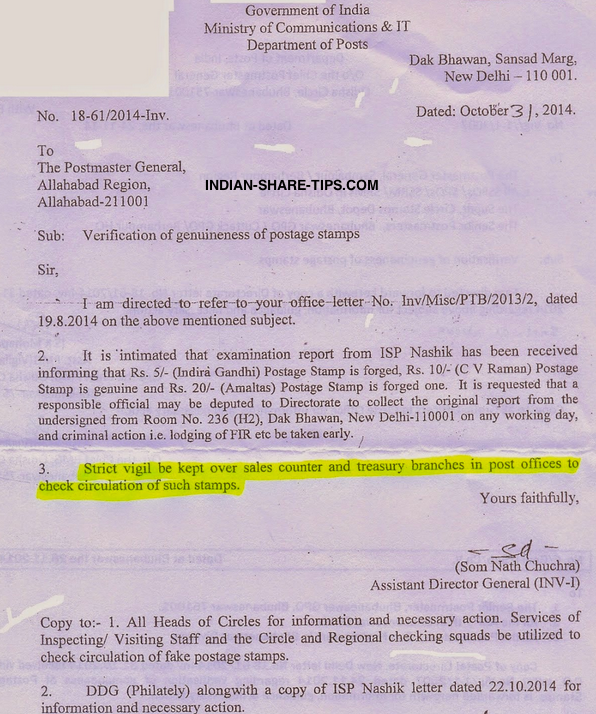 Below letter clearly shows the menace of fake stamps in India. We wish Post Office all the best for their endeavours and in their effort of a postoffice becoming a bank in India.